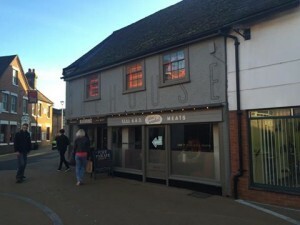 Bluegrass opened its doors around September 2014 and I have been a fair few times, however this is the first time I went there with the intention of doing a serious review of the restaurant. This restaurant is a shining beacon in the middle of what is otherwise a pretty grey and dull area. The building used to be a rather questionable Chinese buffet, and then a night club, and now an authentic American smokehouse. The building is old, and the interior design of the restaurant really plays to this. Exposed beams, wonky ceilings and uneven walls all add to the atmosphere. The interior design is impeccable, it is very well planned and considered. Lots of bare metal and old industrial themed furniture give the place a really modern and trendy feel, I believe the style is known as “Industrial Chic”, but whatever the style is, they do it very well. I can’t wait to see what they do with another size or shape of building when they inevitably open up more Bluegrass sites. This particular outing was a lunchtime birthday get together with some friends, and we were seated upstairs. Even at lunch time on a Wednesday, the restaurant was fairly busy and was buzzing and exciting. The restaurant operates a counter service system, a bit like Nandos, so you note your table number and go downstairs to order. 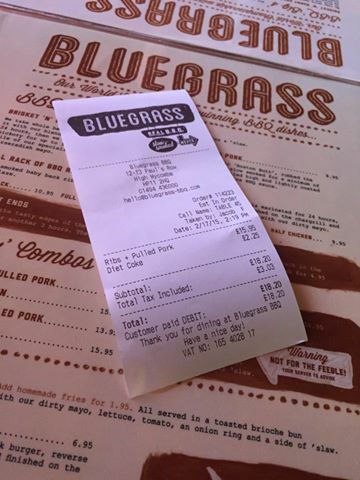 I had pulled pork and ribs (£15.95), whilst others in our party had burgers, chicken, and the birthday boy himself opted for the enormous 25 quid Pit Boss Platter. 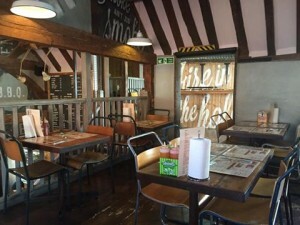 One thing that I feel needs mentioning at this point, Bluegrass’s Nandos style counter service works well, but it really falls down in the drinks department. Unlike Nandos, there is no refillable soft drinks system. Most of us had Coke or similar, and its served in a fashionable, but small glass bottle. This means when you run out of coke, you have to go and queue back up with everyone who is ordering food, to get another drink, sometimes whilst your food is getting cold. I would guess this leads to people just not bothering to have a second drink. A self service post mix drinks system really would go well here, although I do accept that the fancy glass bottles go with the restaurants style better than a postmix system might. 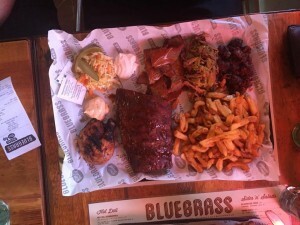 The food arrived, looking fantastic, served directly on trays, in the standard Smoke house style. One thing I like about Bluegrass, besides the obvious, is their chips. They are very obviously NOT from a bag of standard chips from Booker Wholesale. They are rough cut, with bits of skin left on, and they are good. Cheap nasty chips is a huge let down, and bluegrass has done very well on the chips front. I have cooked quite a lot of pulled pork in my smokers, 15-18 hours, with charcoal and oak, and I can say that Bluegrasses pork is pretty damn close to what I have made in the past in my stick burner. They do however serve it with a squirt of sauce on top, a mustard based one. 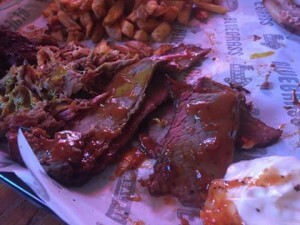 I know its a cardinal sin to a BBQ purist to serve something pre-sauced, but when you take into consideration that most people think pulled pork should be a gloopy brown mess thats squeezed out of a plastic pouch onto the plate, I think it is sensible to add a bit of sauce, at least then the customers have somewhere to start if they decide to add more. The pork is pulled nicely and you can see bits of bark and smoke ring in the meat, which is just how it should be. I did feel the portion was a bit small though. The ribs are baby back, and from my comparatively limited knowledge of all the variations of ribs, they seem to be done in a memphis dry rib style (i think?!). When the restaurant first opened, they did seem to struggle to find their feet with the ribs, I had noticed they served them wet (as in drenched) a few times, but are now back to dry, with a squirt of sauce on top. 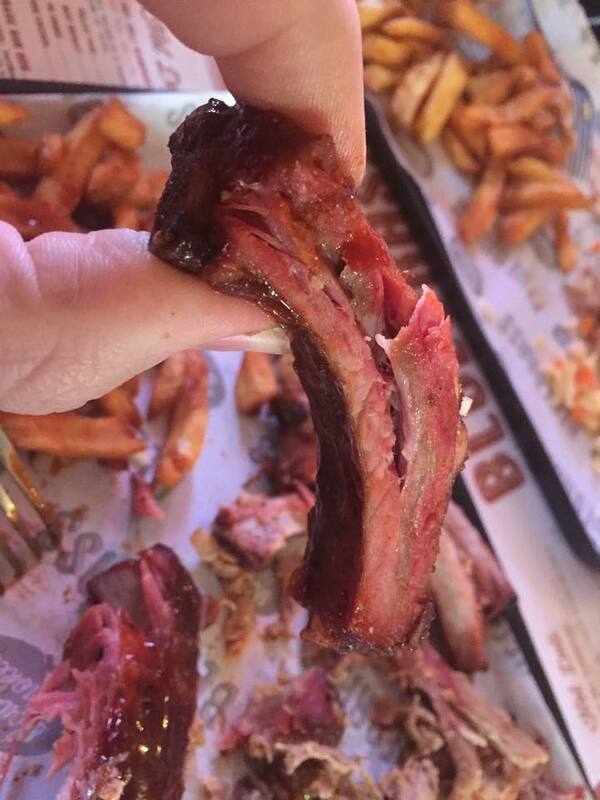 The meat had a good smoke ring, it tore off the bone nicely, however did not “fall off”, which I see as a good sign. The bones were left clean at the end, and everything tasted good. I have done a fair few racks of baby backs in the memphis dry style, and I think the Bluegrass version hits the nail on the head with these. Having read some reviews on tripadvisor etc, there are some people saying things like “I have had better ribs in harvester!” I think this is a bit unjust, as you can hardly compare a rack of boiled-six-months-ago ribs, dunked in sauce and reheated, to something that is actually smoked and prepared properly, but I guess thats just what the publics perception of ribs is. Its a shame, but there we go. I will confess now, I am hardly the brisket king. I screwed up a brisket once, and I have never gone back to it. I have had brisket before in the states and there are a few subtle differences here. The main thing I have noticed is Bluegrass slice their brisket very thin. This is a well known trick to hide badly cooked brisket, however i’m not sure that’s the case. As stated, I am not a brisket expert and I feel unqualified to comment much further than this. There were no complaints from the guy eating it however, and it had a great smoke ring, and again, was served with a bit of sauce on top. I like smoking chicken as it only takes four hours, and unlike ribs, you can just go anywhere and buy a whole chicken, lop it in two and stick it in the smoker, so I have ended up smoking quite a few chickens. The bluegrass chicken looks exactly like mine, and had the famous bbq chicken pink colour to it. I really feel sorry for the staff here who must have to explain ten times a day that its SUPPOSED to be pink. I will confess now though that I have never had a whole portion of chicken to myself at Bluegrass, but when I have tried it, it has been absolutely identical to my chicken, so once again Bluegrass has nailed the low and slow smoked cooking on a restaurant scale here. Personally, I have never had a burger here, as I kinda think if you go to a bbq place, you should have bbq food. I had read on their menu that they smoke the burgers which is odd, and I think there is some kind of reverse searing going on, with the burgers being cooked in the smoker and then finished on a grill. They look good, and friends who have had them have always seemed pretty impressed, and from what I remember from past burger inspections of friends food, they have a bit of a smoke ring to them. The desserts here really are something special. If you have room for one, then try the Reeses peanut butter cheesecake. I dunno how they make it but its pretty spectacular. Just remember to brush your teeth extra hard when you go to bed that night. I have spoken with the owner of the restaurant before, a nice guy who’s heart is in the right place. I was worried that some money driven hard nosed wideboy might be behind the restaurant, wanting to cash in on the popularity of barbecue, but it seems this is not the case. The owner is enthusiastic and knowledgeable about the subject, and is clearly not here purely to milk money out of a new market. He also attended the Jack, where he competed in the winners circle with Jacky Weight, and they did very well there in the brisket category. I have seen his kitchen, and they have four Fast Eddy FEC120 smokers, and he was talking about adding a fifth. 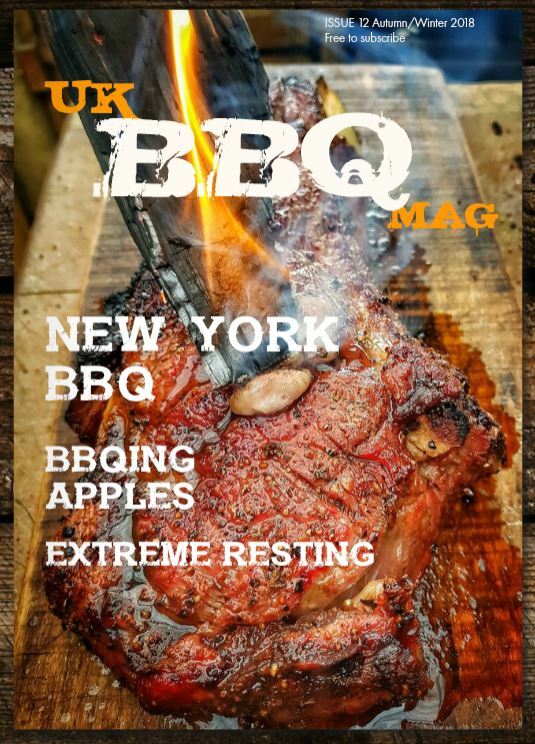 I have also spoken with him at length about their meat (as we all have terrible trouble getting the right cuts of meat for bbq in England) and it is very clear that he is no amateur, and is getting his meat from reputable suppliers. So, all in all, this place is about as authentic, food wise, as you can get. The restaurant itself is very pleasant to sit in, the decor as mentioned multiple times, is incredibly well thought out and executed. If you are looking at experiencing real american barbecue food, then throw away all memories of wetherspoons pulled pork, and harvester ribs, and go to Bluegrass. Thanks for sharing your thoughts Pete, looks like a great place. Certainly he did do a great job, great to hear that there’s some great smokehouses out there. I’ve had their burgers and they are definitely in my top 3. They also have a wide range of ‘american’ drinks such as grape and watermelon which are amazing!